For this episode we go to New South Wales, Australia to bring you Mr. Bill. If you haven't heard of Bill before, we're not too surprised. He's been sort of under the radar until recently but we think this mix will get your attention. Recent credits include remixes for Vaetxh and Bluetech, as well as collaborations with Bran Richards and our own resident Tha Fruitbat. My name is Bill, however I am currently more well known for writing and performing electronic music under the pseudonym Mr. Bill. This project is based around evocation, I like to write music that excites the ear and the brain. This requires me to explore all sorts of strange production methods and musical theories to keep exciting my senses. 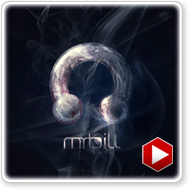 Mr. Bill also teaches Electronic Music Production in Ableton Live with a series of subscription based video tutorials focusing primarily on sound design, synthesis, and workflow. The tutorials are available on his website, Mr. Bill's Tunes, by registering and becoming a paid subscriber. Subscription also gives you access to Bill's Ableton Live devices, samples, and even Ableton project files. There are also free tutorials and articles available to non-members. This track is sick donk zir! (translation) I am a fan! wow!!!! thats all I can say is wow!!! producers like mr. bill truly inspire! amazing sounds here.